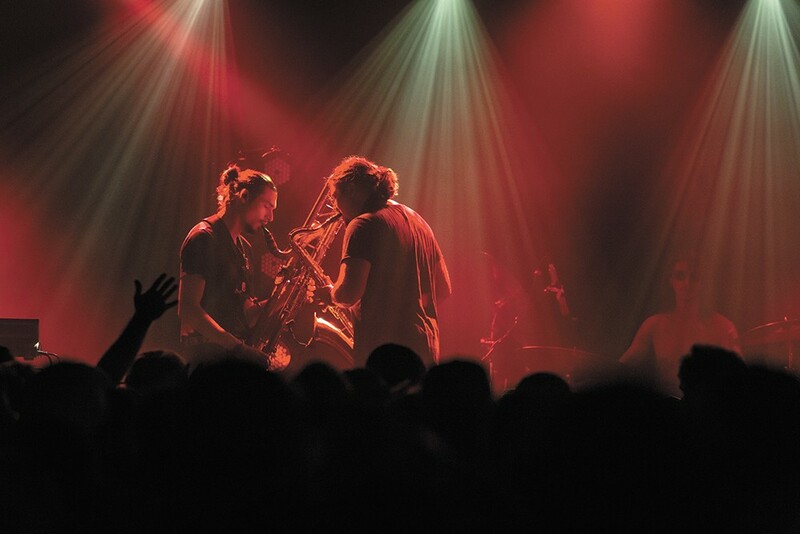 From buskers to headliners, Moon Hooch makes danceable sounds out of unusual instrumentation. Mike Wilbur is in a surly mood when the Inlander calls him on a recent afternoon. He's in a van with his Moon Hooch bandmates somewhere outside of Houston, and because his mind-changing substance of choice remains under prohibition in the Lone Star State, he's had no choice but to get overly caffeinated. "I'm on edge," he says. "Weed's still illegal here and we don't have any, so that's a bummer. I smoke a lot of weed." It's a strange and mildly hostile introduction to the trio of virtuosic, classically trained jazz players. Wilbur met fellow saxophonist Wenzl McGowen and drummer James Muschler while attending the New School for Jazz and Contemporary Music in New York. They formed Moon Hooch in 2010, cutting their teeth by busking on the subway and throwing illegal raves. Moon Hooch's "cave music" — the band's preferred term — is a mix of jazz and house dance beats, performed with a rare sort of raw, animalistic energy. Roughly 30 to 40 percent of their live sets are improvised, with frequent detours into bizarre noise-making sessions in which Wilbur and McGowen mimic the abrasive sounds of dubstep with their horns. They've found low-end frequencies to be particularly effective in the dance setting. "We've been using a lot of bass instruments like the contrabass clarinet and a Moog synthesizer," Wilbur says. "We also have an octave drop on our baritone saxophone, which is pretty beefy and sick." Their performances come off as a little crazy, which is pretty much the point. Everyone had better jump around, or else. "We like to get wild. The more you learn about how f---ed humanity and society is, the crazier you get and the more disassociated from this reality you become," he says. "To me, this society is weird, we're not weird. When I walk into somebody's house and they're watching this TV series they're really invested in, that's kind of weird to me. ... It's more normal to do things that are good for you and make you a better person than to, like, sit around and do nothing. To me, that's crazy. "We're animals, we're supposed to be jumping around like f---ing apes," he continues. "That's still part of who we are, we're still wild creatures. I think everybody should jump around and act crazy as long as they're not hurting each other or being racist assholes." Given their academic background, some jazz traditionalists probably frown upon the trio's wild ways, but Wilbur, for one, couldn't give a fig about offending anyone. "There's always going to be people who aren't into what you're doing, no matter what, even in jazz, " he says. "If you play like Charlie Parker, there's going to be this, like, sect of specialists who think you're an idiot for doing so. I'm sure there are plenty of people who don't leave the house who really hate us." After nearly a decade of making percussion-based, highly improvisational music, Wilbur has no wisdom to share about the science of making people dance. It's just all about that beat. Muschler always keeps the groove going, even beneath the fiercest squalls of woodwinds. "The important thing is that you have a four-on-the-floor kick drum at 120 beats per minute," he says, more than a little saltily. "You could fart on top of it and people would still dance." The original print version of this article was headlined "Battle of the Saxes"